Are you looking for historical monuments of India? Here is the list of 11 most famous historical monuments of India that everyone should visit to get familiar with Indian rich culture, architecture and the perfection of craftsmanship make one fall deeply in love with them. India is a land of forts and monuments and every monument has a story to tell. Their brilliant architecture and interior designing make one fall deeply in love with them. Here we are with a list of 11 most famous historical monuments of India famous all over the world and will take you back in time. Ajanta Caves are situated at a distance of 107 km north of Aurangabad nearby the village named Ajanta located about 12 km from the caves. It is one of the famous historical monuments of India. Ajanta caves are a very popular tourist destination in the world famous for its murals and the finest surviving examples of Indian art, particularly painting. It is also one of the world heritage sites in India. Ajanta is a beautiful collection of 30 out of which 9, 10, 19, 26 and 29 number caves are Chaityas (Shrines) dedicated to Lord Buddha and the rest are Viharas (monasteries) used by Buddhist monks for meditation. Ajanta Cave paintings dare to depict the incidents from the life of Buddha and the Jataka tales. The paintings are made on a ground of mud-plaster in the tempera technique and the colours used for the wall paintings were made from pebbles and vegetable found on the hillside. All these attractions make Ajanta Cave as famous historical monuments of India. Besides the temples and monasteries, caves are also popular for magnificent murals that attract visitors from all over the world. 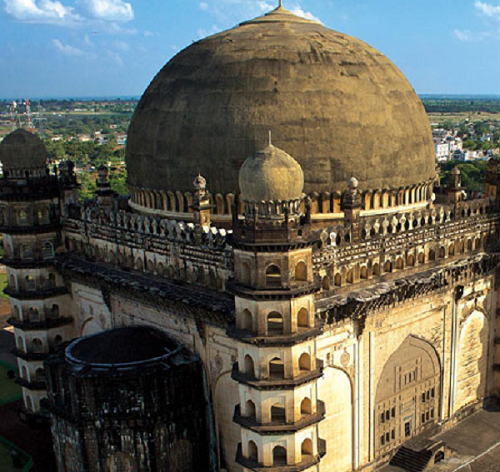 Gol Gumbaz also known as the Taj Mahal of South India is located in Bijapur is the most popular heritage structure of the state and famous historical monuments of India. It is a tomb of Muhammad Adil Shah along with the tombs of his wives and daughters. It was completed in 1656 by the famous architect of that time Yaqut of Dabul. It is a cube structure of 47.5 metres (156 feet) on each side, capped by a large dome of 44 m (144 feet) diameter. Eight intersecting arches created by two turned squares that make interlocking pendentives support the dome. At each of the four corners of the cube, there is a dome-capped octagonal tower of seven stories with a staircase inside. Inside the mausoleum hall there is a square platform, in the center of this, a cenotaph slab on the ground denote the real grave below. Inside the dome, there is the "Whispering Gallery" where even the mildest sound can be heard on the opposite side of the mausoleum because of the acoustics of the space. Gol There is a The Archaeological Museum inside the Gol Gumbaz Complex. Entry fee is Rs. 10 per head for the Citizens of India and Rs. 200/- per head for foreigner tourists. Red Fort popularly known as Lal Quila is located in capital city Delhi and the most famous historical monuments of India. It was the residence of the Mughal emperor for until 1857. Red fort was constructed in 1648 on the order of fifth Mughal Emperor Shah Jahan. It took about nine years to complete the construction of the fort from 1639 to 1648. In 2007 UNESCO declared the Red Fort a World Heritage Site. 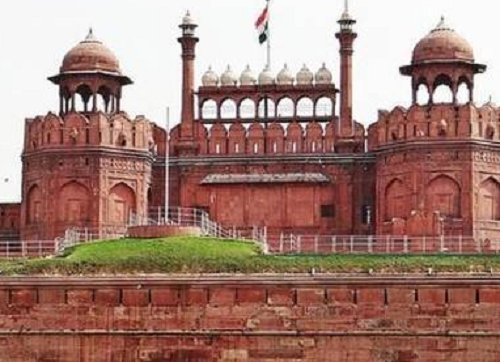 The monument was made up of large sandstone of red colour gave it the name Red Fort. Spreading over an area of more than 250 acres of land, Red Fort is one of the best examples of Mughal architecture. Bahadur Shah Zafar was the last Mughal ruler to inhabit the Red Fort Delhi till 1857. Every year on Independence Day the Prime Minister of India hoists the national flag at the main gate of the fort and delivers a nationally-broadcast speech from its ramparts. The shape of the fort looks like an octagon. Lahore Gate, Diwan-i-Aam, Diwan-i-Khas, Moti Masjid, Hayat Bakhsh Bagh are some of the important structure inside the Red Fort complex. Every evening there is a spectacular display of history and events related to the city of Delhi in the form of light and sound show organized at the Red Fort. The entry for same is Rs. 60 for adults and Rs. 20 for children on weekdays and Rs. 80 for adults and Rs. 30 for children on weekends and public holidays. Hampi is situated on the southern bank of the river Tungabhadra in northern Karnataka, India. This is the famous historical monuments of India. Hampi monuments were built between AD 1336-1570 during the times of Harihara-I to Sadasiva Raya. Hampi is an important religious centre of that times consisting of Virupaksha Temple and several other monuments belonging to the old city. The ruins of Hampi were discovered by Colonel Colin Mackenzie in 1800. The landscape of Hampi is full of with large stones used to make statues of Jain deities. 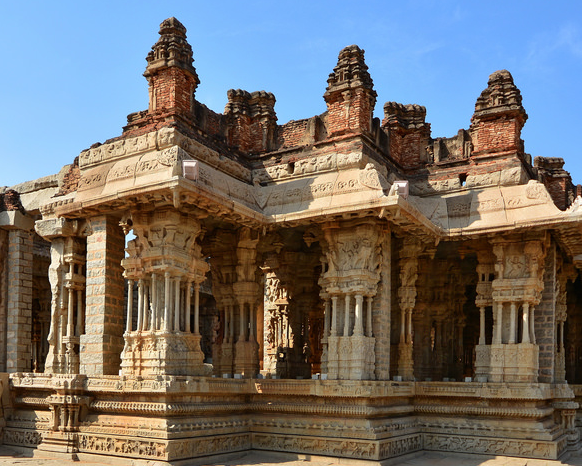 Historical monuments of Hampi can be divided into Religious, Civil & Military buildings. The Jain temples on Hemakuta hill, the two Devi shrines & some other structures are there in the Virupaksha temple complex. Many Hindu temples BadaviLinga, Achyutaraya Temple, Chandramauleshwara Temple, Malyavanta Raghunathaswamy temple, Jain Temple, Hazara Rama Temple Complex, Krishna Temple Complex and Vittala Temple Complex are famous for musical pillars. 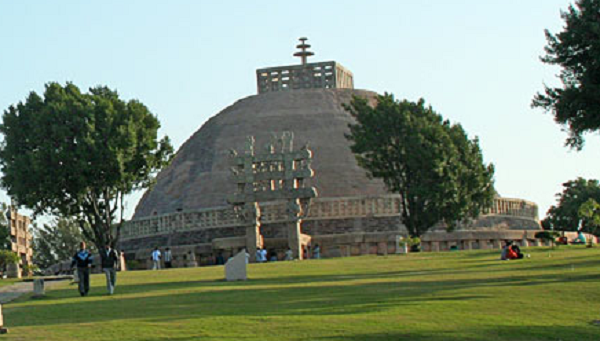 Sanchi Stupa in Raisen district of Madhya Pradesh is the oldest stone structure in India and famous historical monuments of India. It is a hemispherical brick structure containing relics of the Buddha or his followers. It was made during 3rd century BCE on the orders of Emperor Ashoka to preserve and spread the Buddhist philosophy under the supervision of his wife Devi as Sanchi was her birthplace as well as the venue of their wedding too. There is the giant image of a seated Buddha depicting the supreme enlightenment inside the temple. It is declared as A UNESCO World heritage site and this is one of the important historical monuments of India. This Great Stupa served as a nucleus to the large Buddhist establishment during the later period. Golconda Fort is about 9 km from Hussain Sagar Lake located in the western part of Hyderabad city is the famous historical monuments of India. It is one of the most beautiful and finest forts in India. It was built on a hilltop in the year 1143 on 400 feet high hill by the orders of Rajah of Warangal. There are many ruins of palaces, mosques and a hilltop pavilion in the premises of the fort which tells its story itself. One can witness fantastic acoustical effects as a remarkable signalling device had been incorporated in the construction of Golconda Fort. Clapping your hand at a certain point near the entrance dome reverberates and can be heard clearly at the hilltop pavilion i.e. almost one kilometre away from the dome. Some other buildings found inside the fort are Habshi Kamans, Taramati mosque, Nagina bagh, Durbar Hall, Ambar khana etc. Entry fee is Rs. 5 per person for Indians and Rs. 100 per person for foreign nationals. Light and Sound Show Ticket price at Golconda Fort is between Rs. 80 to Rs. 140. 1st Show English (All Days) 2nd Show in Telugu on Monday, Wednesday & Friday, and Hindi on Tuesday, Thursday, Saturday & Sunday. Show Timings- (November to February) 1st Show 6:30pm 2nd Show 7.45pm (March to October) 1st Show 7:00pm 2nd Show 8.15pm. Khajuraho Temples are among the most delightful medieval and famous historical monuments of India. These were made on the orders of Chandella ruler between AD 900 and 1130 known as the golden era of Chandella rulers. Khajuraho is known for its fancy temples that are a fabulous piece of human creativity imagination, great architecture and to deliver spiritual peace through eroticism. Khajuraho is the chain of 85 temples out of which just 25 temples remaining and survived after the different phases of preservation and care. These temples are scattered over an area of around 9 square miles. 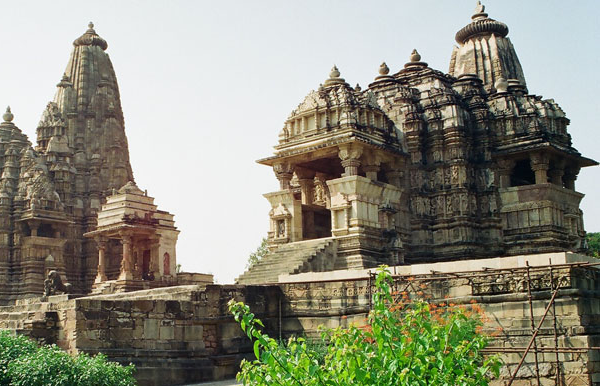 There are 3 groups of Khajuraho Temples- Western, Eastern, and Southern. The main temples are in the Western group, which highlights the grand Kandariya Mahadeo Temple. The Eastern Group contains various beautifully created Jain temples. There are just two temples in the Southern group. The 50 minutes sound and light show is also conducted by tourism office in the garden of the western group of temples. There are a sound and light show conducted by tourism office in the garden of the western group of temples narrated by the Bollywood icon Amitabh Bachchan every evening in English: 06:30 pm to 07:25 pm. Hindi: 07:40 pm to 08:35 pm. Tickets cost Rs. 120 rupees for Indians and Rs. 400 rupees for foreigners. Taj Mahal at Agra is one of the 8 wonders of the world because of its magnificent architecture and beautiful craftsmanship. 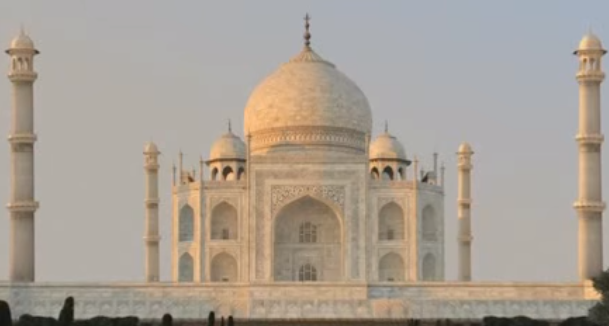 It is the most famous historical monuments of India. It is one amongst the UNESCO World Heritage Sites and was cited as "the jewel of Muslim art in India and one of the universally admired masterpieces of the world's heritage". Taj Mahal was built in between 1631 to 1648 on the orders of Mughal Empire Shah Jahan in loving memory of his wife Mumtaz Mahal. The Taj Mahal is considered the finest example of Mughal architecture, a style that combines elements from Persian, Indian, and Islamic architectural styles which make it as famous historical monuments of India. Taj Mahal is all made up of white marble on the south bank of the Yamuna River. Beautiful large white marble Dome standing on a square plinth is the central focus of the monument. Beautiful inlay work on the walls of monuments and domes is just mesmerising. The central part of the monument has a stone coffin of Mumtaz Mahal and Shah Jahan as the actual graves are at a lower level. The shades of the Taj vary from dawn to dusk. It looks milky white in the soft light while in afternoon sun makes it glisten bright and dazzling. It shines like a white pearl on a full moon night, attracting lots of tourists on such nights. Taj Mahal remains closed on every Friday. Rs. 40/- per head for Indian citizens, Rs. 1000 per head for foreigner tourists and Rs. 530 for Citizens of SAARC and BIMSTEC Countries, No Entry fee for children below the age of 15 years for both Domestic and Foreigner tourists. Amber Fort or Amer fort is an important historical monuments of India, located in Amer town just 11 kilometres from Jaipur, Rajasthan state. Situated on high on a hill Amber Fort was built on the orders of Raja Man Singh I in the 16th century. 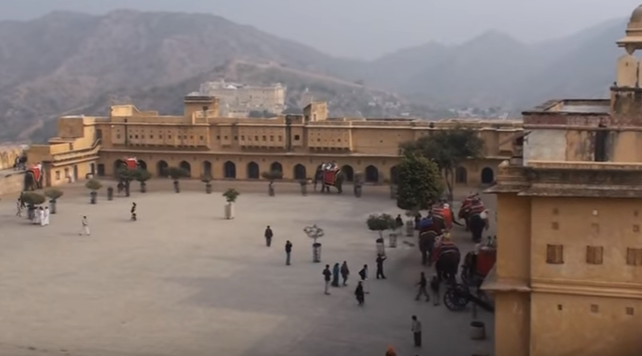 Amber Fort is known for its artistic style a combination of blending both Hindu and Rajput elements. Walls of the palace are designed very beautifully and elegantly. The palace is made up of red sandstone and marble laid out on four levels, each with a large courtyard. It comprises of the Diwan-e-Aam, or "Lobby of Public visitors", the Diwan-e-Khas, or "Corridor of Private Audience", the Sheesh Mahal (mirror royal residence), or Jai Mandir, and the Sukh Niwas where a cool atmosphere is artificially created by winds that blow over a water cascade within the palace. The palace was the residence of Rajput Maharajas and their families. At the entrance of the palace near Ganesh Gate, there is a temple devoted to Sila Devi, a goddess of the Chaitanya religion. 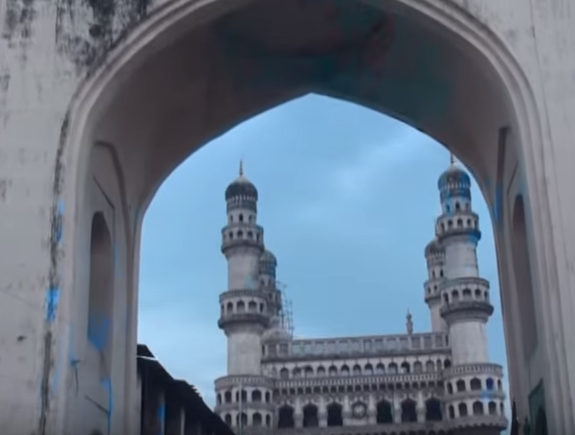 Charminar is one of the most popular tourist attractions of Hyderabad visited by international as well as national tourists in large number. It is a marvellous piece of architecture made up of granite, mortar, limestone and powdered marble which makes one of the famous historical monuments of India. Charminar was constructed in 1591 AD on the orders of the Muhammad Quli Qutb Shah the fifth ruler of the Qutb Shahi dynasty. It is known as the Charminar because of four minarets of 48.7 meters high on the four sides of the monument. There is mosque also at the last storey of the monument where devotees can offer prayers in a peaceful manner. Each tower has four storeys. All the floors have balconies attached to them from where a bird's eye view of the city is visible. 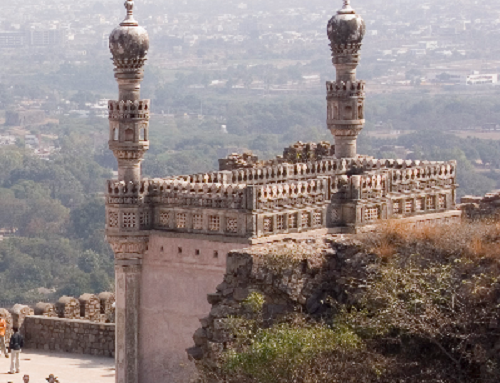 Chittorgarh Fort is one of the largest forts in India and a World Heritage Site too. It is one of the famous historical monuments of India, located in the southern part of the state of Rajasthan. Chittorgarh fort is also called as Water Fort because of its 84 water bodies out of which only about 22 exist today. It is located on a hill of 180 m (590.6 ft) in height spread over an area of 280 ha (691.9 acres). The fort was sacked three times between the 15th and 16th centuries. The fort has total seven gates, The Vijay Stambha (Tower of Victory) or Jaya Stambha was built on the orders of Rana Kumbha between 1458 and 1468 to celebrate his victory over Mahmud Shah I Khalji, Kirti Stambha (Tower of Fame) adorned with Jain sculptures on the outside was built by Jijaji Rathod a Bagherwal Jain merchant, dedicated to Adinath, Rana Kumbha's palace at the entrance gate near the Vijaya Stambha, Fateh Prakash Palace, Gaumukh Reservoir, Padmini's Palace and many other structures to attract the tourists from all over the world. 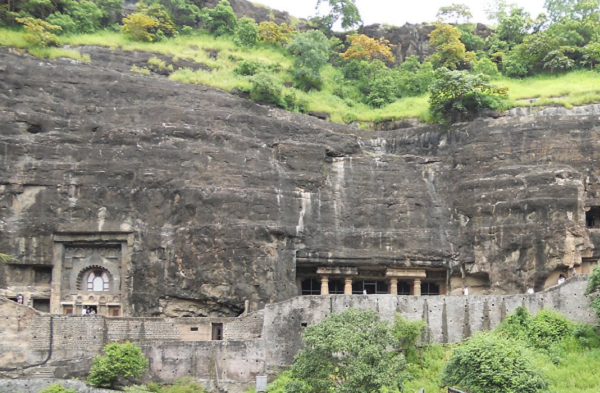 Ajanta Caves located in Maharashtra is one of the most famous well maintained historical monuments of India. Inside the Caves there Amazing sculptures and paintings.